BioVision News | BioVision Inc.
MILPITAS, Calif. - Nov. 20, 2018 - PRLog -- Lysosomal alpha Glucosidase (GAA, Acid alpha Glucosidase, Acid Maltase; EC 3.2.1.3) is an exo-1,4 and exo-1,6-alpha Glucosidase, which is essential for the degradation of glycogen to glucose in lysosomes. Deficiency in GAA activity results in the accumulation of glycogen within the lysosome, leading to Glycogen storage disease type II (also termed acid maltase deficiency (AMD) or Pompe disease). Pompe disease is an inherited disorder of glycogen metabolism with broad spectrum of clinical phenotypes. Cardiac and skeletal muscles are the major target tissues and GAA activity in dry blood spots has been used to screen, and diagnose Pompe Disease. BioVision's Lysosomal alpha Glucosidase (GAA) Activity Assay Kit provides a simple way to monitor GAA activity in a wide variety of Biological Samples. In this kit, GAA cleaves a synthetic specific substrate releasing a fluorophore, which can be easily quantified (Ex/Em= 368/460 nm). The assay is specific, sensitive, it can detect as low as 0.05 µU of GAA activity. 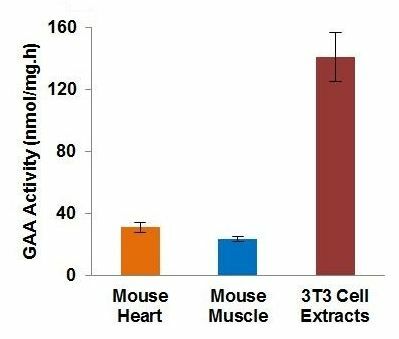 Figure: Measurement of GAA Activity in Mouse Heart Extracts (3 µg protein), Mouse Muscle Extracts (2 µg protein) and 3T3 Cell Lysates (0.5 µg protein). All assays were performed following kit protocol.